Today with Acropolis 4.5 you get to enjoy all of the scale out wonders of our async replication bulition into the Xtreme Computing Platform. Per –VM snapshots allow the administrator save countless hours compared to traditional approaches. Multiple VMs can be grouped together in a Nutanix protection domain enabling them to be operated upon as a single entity with the same RPO. This is useful when trying to protect complex applications such as Microsoft SQL Server-based applications or Microsoft Exchange. The main advantage of using a protection domain approach of grouping VMs versus the traditional SAN approach of consolidating different VMs on to a single LUN is VM portability. VMs can be moved between different protection domains on XCP without the need for any data to be moved or copied or re architecting the Business Continuity design. For traditional SANs, changing a VM’s SLA will most likely require migrating the VM to another LUN or volume. Along with new storage, it will have to be accounted for at the hypervisor layer and you have to account for the configuration time and effort for setup. Nutanix VM-granular snapshots also make it possible to efficiently replicate individual virtual machines from a primary Nutanix cluster to one or more secondary Nutanix clusters. By supporting a fan-out and fan-in or multi-way model for replication, XCP can create flexible multi-master virtualization environment for backup and disaster recovery. 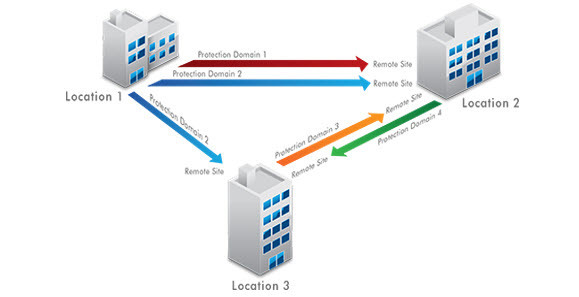 Deployments supporting numerous remote and branch offices can benefit from a flexible deployment model. Interestingly Acropolis based hypervisors clusters can be also used backup ESXi clusters. You can set a low retention schedule on the primary side and have a large retention schedule on the remote based acropolis side. Today you can also use our storage only nodes the NX-6035c to form a backup cluster to save on storage and licensing costs. You could also use AHV at remote sites and replicate back to ESXi/Hyper-V cluster back at corporate. Another point worth mentioning is that the replication service is also scale out. As you grow your cluster on Nutanix, replication will not become a bottleneck on a couple of nodes. All of the nodes are designed to participate in replication. You can see step by step in this online guide that walks thru setting up aysnc replication written by one our Sr. Global Services resources. The outline is for vSphere but the process is the extact same for the Acorpolis hypervisor. Questions about DR on the Acroplois Hypervisor? Leave a comment here or find me on twitter at @dlink7.